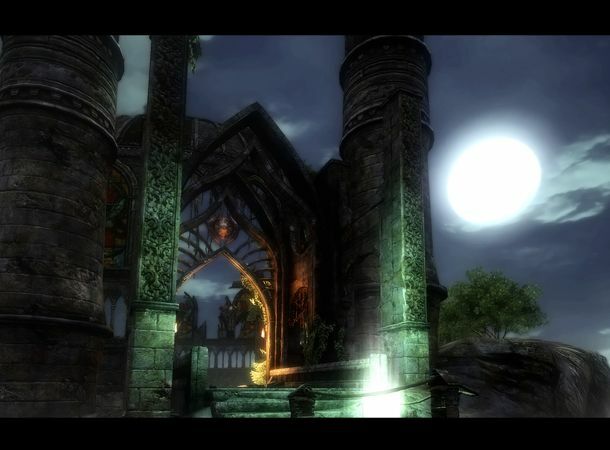 Full review: Can this RPG sequel take on Oblivion? Can the disppointment of Two Worlds be transformed into a sequel to challenge an aging Elder Scrolls IV The truth? No. This is another whiffsome mess of role-playing. One of this adventure's principle gimmicks is that - rather than have to make the early sacrifice of plunging points into various skills and attributes (and therefore, say, ruling out any chance of being a mage or ranger class without another playthrough) - our hero is able to wield blade, bow or mage's staff with equal gusto. Unfortunately, even on lowly 'medium' difficulty, Two Worlds II is hard as nails - and we mean really, really hard. We ended up having to plunge all our points into levelling up our health and skills as it soon became clear that range-based attackers were ineffective against the eclectic selection of zomboids, mummies, rhinoceroses and... ostriches that roam Two Worlds II's wilderness. switch over to sword and armour, ready to mop up the grisly remnants... the whole set-up just doesn't work. Looks-wise, it's the usual fantasy RPG story - with some reasonably purdy looking forest/mountainous/desert areas underpinned by shatto character models. Rant all you like about Bethesda's dated engine, but a half-decade-old Oblivion still looks leagues better than this. In terms of atmosphere, it hardly helps that the game's princely lead is an obscenely gravely-voiced self-parody of a hero, a voice hilariously at odds with one of the campest running animations we've ever seen. If you manage to make it through the underwhelming first five hours, things gradually begin to pick up, but then that's never been our issue with Two Worlds. It always presented a sprawling world, with a selection of (middling) quests and an impressive amount of inventory. The trend continues here; the magic system (handled through a deck of cards) is a nice touch, as is being able to reduce items to their component elements to reinforce or indeed construct other weapons. Like we say, persevere and it's not a total loss, but the languid opening is a considerable barrier to entry to all but the most determined adventuring sorts. The bugs don't seem as numerous nowadays, but the AI is still awful (sometimes an enemy follows you to the ends of the earth; sometimes they give up and prance back to their start position even while being pelted with arrows; sometimes they just stand there and take it), while strange events abound (keep your eyes peeled for errant barrels rolling down hills for no apparent reason). If you're after a bland slog-o-thon of an adventure that'll easy soak up fifty hours of your life while never truly thrilling you, we're guessing you might see something in Two Worlds II. In the final analysis, though, the wealth of content means nothing when it's so torturously implemented. Any fantasy role-player released continues to be compared to Oblivion, and there's a reason for that - it's the standout genre piece by a country mile.